If you have any questions or want to enquire about dates, use our form to contact Matteo Fabra. Friendly owner Matteo Fabra has created a peaceful, stylish sanctuary surrounded by 18 acres of pasture, orchards, woodland and garden.Breakfast on fresh bread and pastries with homemade marmalade and organic estate honey on the terrace. 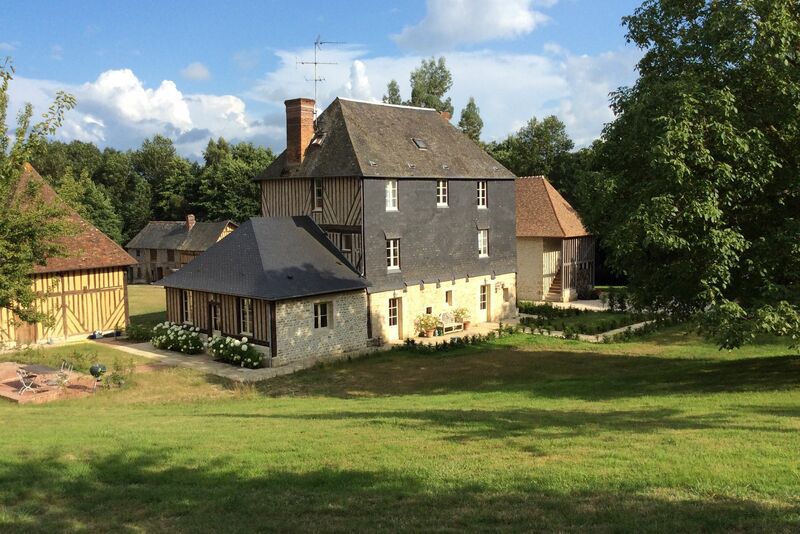 You’re deep in unspoilt French countryside – perfect for long walks through fields and woods. But you can explore the manor grounds first – there’s a croquet lawn and a boating pond.Pack up a picnic and head to the coast for a day out, taste cider and calvados, return to an open fire and a comfy sitting room. Drive to the nearby village (just a mile) for dinner. Please note that we do not accept credit cards, only cash or transfers. Use of the kitchen for more than 2-night stays. Le Fresnay has stylish interiors, spacious exteriors, very nice contemporary bathrooms and a pleasant owner. A beautiful situation and scenery with mature trees and fabulous views. Far from the madding crowd...A lovely place to be, & I would love to stay there. 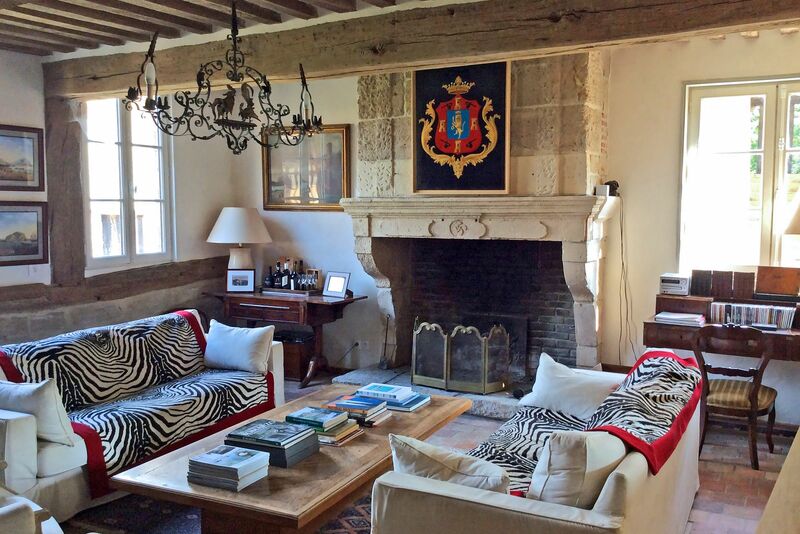 Le Fresnay has recently been renovated but kept much of the original flooring and beams. Matteo has made a beautiful and very tranquil place. Although cutting the many acres of grass seems to be almost a full time job. We spent our second evening having a BBQ with Matteo while chatting about British TV comedy, travel and many other subjects. On our last morning he drove us to the local honey producer and then a calvados distillery. Matteo is an excellent host and it is his local knowledge and enthusiasm to ensure you enjoy your stay, that that makes Le Frenay special. 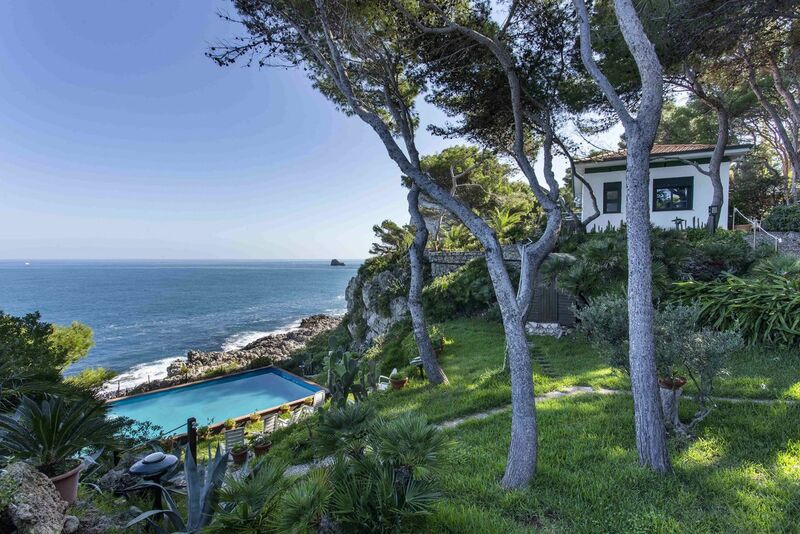 A beautiful nicely renovated farmhouse in a breathtaking landscape. Quiet! Peaceful! Matteo and Lucy are very friendly! They give good advice for excursions in the region! We loved our stay there! Thank you! An extraordinary, breathtaking place. M Fabra (speaks perfect English) is highly knowledgable and generous with his time. The house is almost impossible to find, though you can phone him for better instructions. Rooms splendidly restored but not shouting 'modern'. Dinner at local hotel wholly French, charming and good, washed down with fine Cambremer cider. Georgina, the vast Newfoundland dog is quite lovely, tho not maybe for people with allergies or fear of dogs. We think people looking for a 'modern' B&B would not be happy here but we were completely bowled over. An amazing house & stay ! Our stay at Le Fresnay was thoroughly enjoyable. The setting is wonderful and the house fantastic. We stayed for four nights and we and our dog were made to feel very welcome and comfortable. We would definitely recommend Le Fresnay. This is a charming place to stay. The accommodation is comfortable and the house and gardens beautiful. But what made it perfect was how helpful and welcoming Matteo was to us and our two young daughters. I was unsure of the practicalities of staying in a B&B with small children but Matteo made it easy, allowing us to prepare food for the children and our girls were delighted by the garden and of course the pretend sheep! 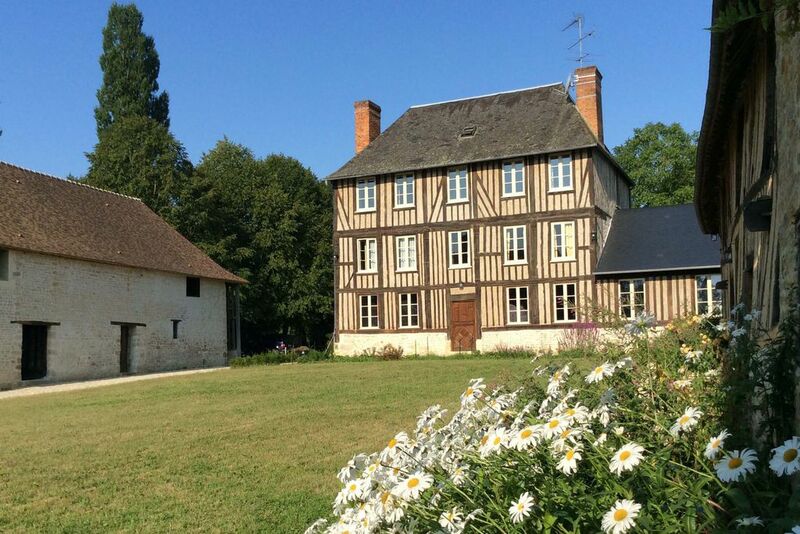 If I could own a home in France, it would be Le Fresney, a gorgeous old manor house in stunning Calvados countryside. Our room at the top of a winding, rickety wooden staircase boasted rustic French charm, crisp white bedlinen and a vast bathroom combining aforementioned charm with ultra-efficient modern fittings. In a to-die-for dining kitchen lay crusty bread, homemade jams, yogurt and fresh coffee. We loved the woodsmoke-scented living room, all antiques, timeless elegance and squishy sofas - and Le Frensey's owner, the handsome, erudite Matteo, who truly seems to enjoy his guests' company. Superb accommodation (location, bedroom, communal areas). Warm reception from Matteo and George (a very friendly Briard). Recommendation and reservation at an excellent local restaurant, preceded by a calvados and interesting conversation with Matteo in front of an open fire. Excellent night's sleep in a very comfortable bed with not a noise to be heard. Very good breakfast with some local produce which ended up lasting 90 minutes due to the conversation with Matteo (an extremely interesting guy) which flipped constantly between french and english. In summary, faultless! Beautiful, sunny en-suite bedroom of the highest standard: 2m x 2m 4-poster bed, excellent bed/bath linens, great bath, walk-in shower. Matteo - infinitely hospitable & relaxed: breakfast any time, multiple fantastic recommendations for restaurants & places to visit during the day - all with hand-drawn directions to ensure we arrived relaxed & hassle-free, then an aperitif or a calvados in front of the fire in the evening. If you are looking for high comfort, beauty, peace and relaxation, Matteo’s manoir feels like a home-from-home. Look no further. Le Fresnay is a place w'll return to. A beautifuly restaured farmhouse in a magnifique landscape. Matteo is the entertaining host who knows a lot of the cultural 'must sees' in the Calvados. We stayed a week and enjoyed every day. I have been at "Le Fresnay" on last august 5th and 6th. I was with my daughter Angelica. It was a very good experience. The silence, the beauty of the place and the welcome were fantastic. When I'll plan another holiday in normandy I'll book at "le fresnay" for sure!!! You’re a mile from the village of Cambremer, with a couple of restaurants and shops. The nearest sandy beach is at Cabourg, a 30-minute drive north, but history buffs will head for the WW2 landing beaches stretching up the coast above Caen, 40 miles away. You can be in Bayeux, home to the famed tapestry, in an hour. Kids will enjoy the Chateau de Crevecoeur, a well-preserved medieval enclave five miles away which hosts historic re-enactments. Drive or cycle along the famous Route de Cidre for the 40 km cider and calvados trail. Explore the wonderful Jardin de Cambremer - one of the most beautiful gardens in Normandy. Close to the coast with interesting port towns of Cabourg, Deauville and Trouville only 30 mins away. You'll find Honfleur 45 mins away too. Matteo is very pleasant and hospitable. Originally from Milan, he has lived across Europe and speaks perfect English. He bought this manor house in 2012, and after tons of renovation work, started welcoming guests in 2014. A creative person, he really enjoys altering, improving and decorating his surroundings and has plans for further improvements. He lives here with gentle Newfoundland dog, Georgia, and has adult children based in Paris.